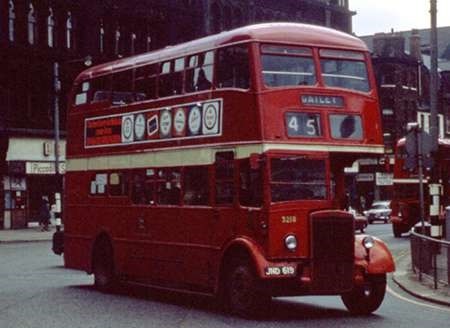 Seen in Piccadilly in August 1969 in the final months of Manchester Corporation ownership is No 3218, JND 619, one of a batch of Leyland PD2/3 buses purchased in 1951. 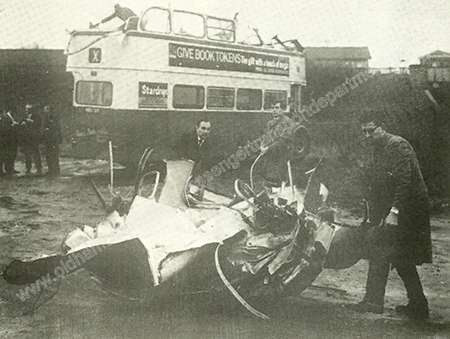 Despite appearances, the bodywork is not by Crossley, being instead of the then standard Manchester design built by Metro-Cammell. Having given some eighteen years of service to Manchester, this bus survived to pass into the SELNEC era, though not, I suspect, for long. This would be on a rush hour full service length extra on which these and the similar looking PD1/3s, which were withdrawn between 1967 and 1968, were regular performers. According to the official SELNEC fleet allocation these PD2/3s were not taken into stock, although Eyre and Heaps in the Manchester Bus have all but 3224, withdrawn in April 1969, transferred to SELNEC. What I suspect happened was that the vehicles were deemed withdrawn at midnight, MCTD having ceased at 23.59 on October 31 1969, SELNEC coming into being at 00.01 on November 1 – such are the legal niceties! Further to my previous comments, the SELNEC operational fleet allocation on formation has 300 PD2s from Manchester and 103 from Salford in the Central Area fleet listing. No Manchester and Salford PD2s were allocated to other divisions on formation. The SELNEC stock allocation i.e vehicle assets taken over in whatever state, lists 501 PD2s in the Central area. Taking Eyre and Heaps listings in the Manchester Bus and in the Salford lists available, the number of PD2s owned by those undertakings on October 31 1969 was 387 in Manchester and 103 in Salford giving a total of 490. The situation would seem to have been that 67 PD2s from the MCW and Leyland bodied JND registered batch in the sequence 3200-3299 were transferred as assets but immediately deleted from the available fleet along with 1 from the Northern Counties batch 3300-3329 and 19 from the Leyland bodied batch 3330-3369. There is photographic evidence of one or more of these batches pressed into SELNEC service. There is however a discrepancy of 11 PD2s between the 501 listed as assets and the total of 403 operational and 87 midnight withdrawals. If anyone can find the missing 11, given that as far as I can ascertain, the assets of the Central division did not include any transfers in from elsewhere at the time of formation on November 1 1969 I would be grateful. I regularly travelled to and from school on these buses between 1964 and 1967. I understand that the shallower windows on each side at the rear were to support the platform which was not supported underneath as on most buses. I have read that Metro Cammell came up with this design, although Crossley adopted it as standard for a while. Manchester certainly got its moneys worth out of these buses and although quite elderly they were used on many lengthy prestige routes until the end of MCTD. They regularly appeared on the 17, 24 and 90 in Rochdale by which time the joint operating partners, Rochdale and Oldham on the 24 and 90 were using more modern stock. I always found them rather drab buses to travel in with lots of dark woodwork and a fairly depressing moquete pattern for the seats. And of course like most buses of that time the upper deck reeked of stale tobacco smoke. I think the experience of 1950’s upper deck travel so Mum could have a fag made me a life-long non-smoker! I was living on Barlow Moor Road in Didsbury in 1969 and 1970, and I remember 3218 as being the only one of these at Parrs Wood garage – very much the odd one out; always slightly surprised when it turned up, which it often did on rush hour extras. I have slides of 3237, 3246 and 3255 taken in Manchester on October 29 1970. They did not sport the green SELNEC Central S.
They were showing the following route numbers 64X, 63X, and 62X respectively. Stephen, the Central flash was Blue. Green was for the Southern Division, Magenta was the Northern Division, and the Orange was for the Coaches, Parcels, and Central activities. Brown was later used for the Cheshire Division, the ex North Western Road Car Company. I was using rush-hour limited-stop services along the Hyde Road corridorout of Chorlton Street bus station for a time between 1970 and ’71 and several of these "32xx" PD2s turned up regularly on routes such as the "124" and "207/208/209". The buses were run-down inside (torn-rexine) and were probably living outside the Hyde Road depot in the yard,awaiting the chop. John, you are most likely correct in your assumption as to the source of the rush hour extras. SELNEC would have preferred not to have taken any vehicle assets over fifteen years old but the legislation demanded that the undertakings absorbed were absorbed lock, stock and barrel. The distinction that was made between the operational fleet and the total vehicle assets was quickly blurred due to the need to move vehicles around the divisions to introduce OMO and the need for extra vehicles caused by delays in deliveries. It would seem that the best runners from the withdrawn stock that still had valid certificates of fitness were temporarily relicensed to fill rush hour gaps. It was estimated that in 1965 one third of the Manchester fleet was retained for rush hour duties, generally vehicles over fifteen years old and apart from the 1953/1954 Daimlers which SELNEC took into the operational fleet, all those older vehicles in the Manchester fleet in 1969 were originally listed as non-operational. In passing it is worth commenting that the MCW PD2s outlived the newer Northern Counties bodied batch from 1953. I moved to Manchester to become a student in October 1970 and I am absolutely certain that MCTD 32xx series buses were in service then and at least for a few months afterwards. I do not recall seeing any 33xx series fleet numbers and I assumed that they had been withdrawn previously although at that stage of my university career I admit that I did not go far off the Oxford Road/Wilmslow Road axis. I became a Manchester student a year after Peter, and didn’t move far off the Oxford Road/Wilmslow Road axis either. My abiding memory is of the 1953/4 Daimlers on the 44/46. I do not remember the PD2s at all. Regarding Phil’s comment about a third of the Manchester fleet, I must admit I’ve always understood it to be the other way round – i.e. that Manchester’s peak problem was so severe that only one third of the fleet was out all day, with the majority being confined to rush-hour extras, rush-hour services, works services, works variants and works contracts. But I’ve believed that for so long now that I’ve no idea where I got it from. Regarding Peter Williamson’s comments on the proportions of the Manchester fleet, the situation as he has it was certainly the case up until the late 1950s. From then things started to change. Rapidly increasing car ownership was the main factor but there were others. New vehicles delivered from 1957 had around 17% more seats than those they replaced and the eventual inclusion of reasonable numbers of Fleetlines and Atlanteans saw this figure rise to over a third more seats per bus. Diesel trains replacing steam on commuter lines and the electrification of lines to Crewe saw faster, cleaner and competitively cheap trains and the decimation of the Crossley fleet ahead of normal life expectancy were all factors which changed the the fleet use proportions. By 1969 the use of private cars had massively increased over that of 1960 and with far further large capacity vehicles in service, including the Mancunians, the need for a large rush hour fleet had diminished further. I’ve spent some time trying to reconcile the number of PD2s the SELNEC Central Division inherited and operated given the confusing numbers published in Eyre and Heaps The Manchester Bus, Manchester and Salford – One Hundred Years of Municipal Transport, Stewart Brown’s Greater Manchester Buses and my own sources from MCTD, Salford and SELNEC from 1968 through 1970. My own notes show that SELNEC intended to reduce its fleet of traditional front engined vehicles in short order and introduce OMO as soon as possible – an aspiration repeatedly delayed by late deliveries, the need to write down assets and union negotiations. It is a fact backed by written information from SELNEC, that SELNEC Central Division required an Operational Fleet for daytime running of 400 PD2s to cover services, maintenance, reserve vehicles for breakdowns and education departments’ needs. The Operational Fleet as far as PD2s were concerned was restricted to vehicles of less than 15 years old, in fact the oldest vehicles were the 1956 3400 series PND registered ex Manchester PD2s. Manchester contributed 300 PD2s, Salford 103. No vehicles to the best of my knowledge were imported to Central from other divisions. In addition to the Operational Fleet it appears Central had a fleet of licenced, driver training and withdrawn PD2s, all transferred from MCTD. The Manchester Bus in its vehicle listings at the back of the book infers the PD2s older than 15 years old that were transferred to SELNEC were fully licenced vehicles. Manchester and Salford a Century of Municipal Transport breaks down the transfer into driving school and withdrawn vehicles, as can be found on page 301 of The Manchester Bus, leading to the conclusion that the withdrawn vehicles were delicenced at midnight on 31 October/1 November 1969. However, the Eyre and Heaps publications disagree with each other in terms of numbers and because Manchester and Salford a Century of Municipal Transport was published much later than the last edition of The Manchester Bus, I have taken the latter’s figures. Central still required a reasonable number of rush hour extras and the older PD2s that were licenced, were thus employed. Most were withdrawn during 1970, the last of the pre 1956 PD2s in early 1971. The next discrepancy is that Greater Manchester Buses states that 501 PD2s were inherited in total and does not break down the numbers. MCW Manchester Standard bodied PD2s 3200-3223 and 3225-3264 were transferred as licenced – total 64. The overall PD2 assets transferred, if the later figures compared to the previous figures I had are to be believed number 514, now 13 more than noted in Greater Manchester Buses. Anyone else want to have a shot at sorting this? I’m surprised to read that there was a requirement specifically for 400 PD2s. What about the contemporary Daimler CVG6s (and CCG6s? Surely there would be some overlap between these two types? Salford CVG6 415/16/18/25/28/29/33/39/57/61/63/65/70/73/78/83/84/85/88/98/506/07/11/21/22/24/25/27-29/31/33/35-41/43-45/47/48/52-54/60 Total 48 to Operational Fleet. 4106-4108/4112-4116/19/21 Total 20 to driving school. I feel prompted to make a first contribution to your fascinating forum after stumbling across it whilst looking for information concerning the jointly operated Stockport/Manchester Corporations’ Service 16 Chorlton – Stepping Hill. I was born in Chorlton, attended the grammar school there and recall the day my mother took me for a trip to Stockport on the newly introduced Service 16 on what, to me, was an unusual and interesting single decker with a central exit/entrance. 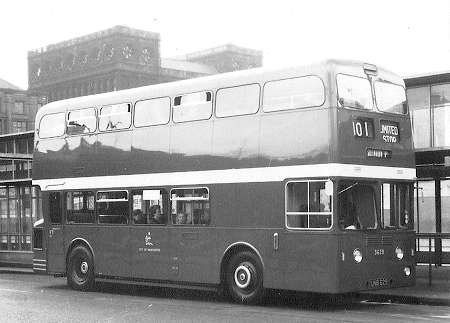 Manchester had no such curiosities (the Royal Tiger ‘Crush Loaders’ with their central doors were still years away and the single deck Leyland (TS5?) used on Service 22 Levenshulme – Eccles was a back loader of sorts. Little did I know then that I should have the thrill of driving a Royal Tiger on Service 22 myself some 12 or 13 years hence! All this underlines my love of anything relating to Manchester buses from the period 1958 to 1989 when I finally put my pen away and began drawing my pension. Having worked alongside John Hodkinson in Devonshire Street’s Traffic Office, I was delighted to see his contribution on the piece about jointly operated Service 95/96. In fact it was this that prompted to make contact. Above is the shiny new Atlantean 3629 at Parker Street on it’s maiden outing, it had spent many weeks in Birchfields Road Garage with the rest of the delivery whilst Union issues were resolved. I remember seeing them there, looking so forlorn, becoming increasingly covered in dust as the weeks dragged by. They had to be put through the wash before going on the road! David, your piece has brought back many memories of the period when the Evening News had regular articles on the dispute (allegedly sought by management by detailing the vehicles for Northenden depot routes where strong union opposition was expected) and the paper dubbed the vehicles Red Dragons -heaven knows why. Whilst the majority may have been gathering dust in Birchfields Rd, there were forays driven by management and inspectors. A number of runs were done down Wilmslow Rd during rush hour mornings for some reason, to the bemusement of many a prospective passenger, and one particular day three of the buses were parked at the side of Northenden depot on the public road. 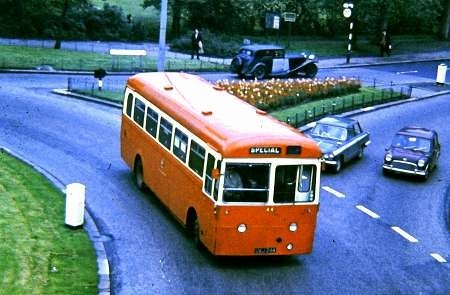 Once the unions and management found agreement the buses entered service on the Wythenshawe routes, then the 50 to Brooklands before moving to Parrs Wood where lower mid panels were often grazed at the tight left turn at the bottom of the ramp! If I can help with info about the 16 please ask. David I worked with John 1973 – 1975 at Princess Road Depot. Princess Road Depot like so many of the old Manchester Corporation/City Transport depots now gone. It’s a small world. I too worked with John Hodkinson briefly whilst a Schedules Clerk at Frederick Road, Salford in 1972/73. There were five of us in the Schedules Office – David Broadbent in charge, John, Peter Caunt, George Boswell and myself. I was the lowly junior, the only ‘foreigner’, who commuted every day across from ‘the dark side’ of the moors in Halifax. Incredibly all five of us were enthusiasts, with yet another – the late Keith Healey – working downstairs, it was a wonderful atmosphere to work in – sometimes it seemed more like a hobby than a job. I then took up the position of Traffic Clerk with the Corporation in my home town. It seemed like the right thing to do at the time, but it was the complete opposite of what I had experienced at SELNEC and boy did I quickly come to regret it! I’ve done that more than once, John, with both musical and teaching posts. When I’ve arrived at the new job, it’s been a poison chalice. "Beware of what you wish for ….."
John and I have exchanged notes of our experiences in the Halifax Traffic Office. In 1964 I travelled 200 miles to take up that job, but the atmosphere was such that I quit within two years. That was 10 years or so before John gave it a go, so it shows how deep seated was the malaise in the place. The Halifax GM might have been a ‘character’, but the tunnel vision at senior subordinate levels was utterly dispiriting. There were also a couple of times when I went out of the frying pan etc………………..also! Phil, such intimate knowledge of the entrance to Parrs Wood Depot via the ramp suggests to me that you might have had personal experience. You have certainly roused my curiosity, or am I barking up the wrong tree? The early Fleetlines and Atlanteans were, in my view, nowhere near as enjoyable to drive as a back loader. Most disturbing factor was the relative absence of sound from the engine. It all seemed and of course was, so remote from the ‘sharp end’. And then there was that awful ‘yaw’ (for want of a better word) that resulted from traversing a series of gullies with the nearside wheels. So much easier to control it when driving a conventional bus. I never got to drive a GM ‘Standard’. Perhaps they had had all the initial quirks ironed out? Those names from the Frederick Road Schedules Office certainly took me back, John. I worked with almost all those guys at some stage or other, though left Devonshire Street in 1972, returning in 1974 after a sojourn in the Hotel business. John H. could always be relied upon to provide the answers whenever we Mancunians needed to know something with a Salford bias. And I seem to remember he had an affinity with a certain Devon-based coaching operation!! I could reminisce all night but I can almost hear the yawns. To close, here is a shot taken at the back of Hyde Road Works of 3520 awaiting disposal. 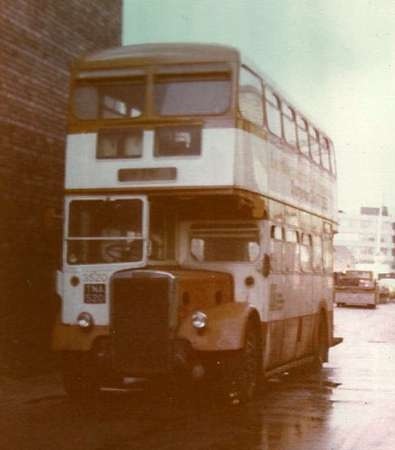 She never looked right to me in Selnec livery but was a fascinating bus to drive – usually on Service 1 – Gatley. David, my knowledge of the ramp at Parrs Wood comes from regular observation over the period from 1958 to 1965 when I would disembark from what was originally the #1 outside the depot to walk across Kingsway to take the #9,#16 or #80 to home on the way back from school. I also had irregular access to the depot through an friend’s neighbour who was an inspector. 3520 looks forlorn in your photo. It looked at its best when on the #1 in original livery, immaculate as Parrs Wood always turned out its star performers, and sounding more like an RT than a PD2. A few more observations about this batch of Atlanteans. They were delivered with thin, low back seats which were non standard. The rear wheel discs, standard on new deliveries at the time, were absent – probably to the relief of the fitters. Was Albert Neal compensating for the extra weight of the longer bus and higher passenger capacity in his continual fight to keep costs down? Whatever the reason, the next foray into rear engined buses, Fleetlines delivered in 1962, had standard seats and rear wheel discs. The Atlanteans were re-seated with standard seats from withdrawn Burlingham trolleybuses around 1966. Some drivers complained about the intrusion of both conductors and passengers into their workspace. Another driver complaint was lack of nearside visibility. There were signs instructing passengers not to stand on the platform area, something many did on back loaders after leaving their seat on approach to their stop, but the habit died hard. A more permanent annoyance for the drivers was the door construction with two part windows in each folding leaf, giving a restricted view to the left – and the doors would not open when in gear. The Fleetlines had full length glass in each leaf. Schoolboys quickly learned where the emergency engine stop was. Located above the bustle on the nearside, it was in reach and many a stop near schools became prolonged until authority in the shape of inspectors and head teachers jointly overcame the problem. Manchester took a long time to be convinced about the rear engine layout. Combined with the City of Manchester Police’s antipathy to 30ft buses in the city centre, it was nothing short of a revolution when the Mancunian appeared, just ten short years after 3629 and its sisters. Wow, may I join the reunion party please? I also worked at Devonshire Street, with David Cooper, David Broadbent and George Boswell among others. However, I was at the other end of the office, beyond Fred Thomas’s goldfish bowl, wherein he sat smoking his pipe and giggling to himself about the latest traffic absurdity. After three years on the lowest grade I was told that there was no prospect of promotion in the foreseeable future (which I can’t understand now, because we all knew that SELNEC was coming, and that changed everything). Basically it was dead men’s shoes and no-one was thinking of dying, so if you wanted to get on you had to move around. So I moved to Newport, which proved to be my poisoned chalice, and after five months I left the transport industry for good. The photo of a brand new Atlantean on the 101 stand reinforces a memory I’ll never forget. The 13-year-old me was so gobsmacked by these things that I just stood there while the entire 101 allocation came and went and the first one came back again. I suppose I could have got on one, but I had no idea where Greenbrow Road was. Hi All! Maybe this page should be titled "Old Boys Club"! Comments have referred to the ramp into Parrs Wood. When the guard-walking-in-front-of-the-bus type smog used to come down, the garage staff used to keep one bay clear inside the depot so the cars that had faithfully followed the bus to find their way home, found themselves inside the depot instead and needed to get out! Peter, that SCT.61 site was new to me (I don’t get out much these days!) and I found it totally absorbing – rather like ‘The Manchester Bus’ but with the superfluous bits left out. Many thanks. Apart from the blinds, that could be 3520 on any day of its first couple of years in service. Like John I had a "couldn’t believe my eyes" moment when I first saw an Atlantean. It was an exciting day in 1960. I had just passed my "eleven plus" and as a reward my mum bought me my first "Combined volume" loco spotting book. We made the purchase in the city centre when changing buses en route to visit relatives. We just missed the #101, which was one of the usual 44xx Daimlers so we stood waiting for the next one, which turned out to be my first sighting of an Atlantean. On seeing the flat front, my first thought was "How did a trolleybus get away from the wires?" but then I noticed the number – 3627 – so it was obviously a Leyland. And we were going to ride on it, two bits of excitement in one day! I couldn’t wait for our return journey that evening, but to my great disappointment it was just another CVG6. A few weeks later we made another visit, riding on 3630 and 3628, but after that they disappeared from the #101. In the autumn of 1963 I noticed an occasional Atlantean running through Middleton, my home town, with "special" on the blinds. These were driver training runs before the batch was transferred to Queens Road Garage, at first on the #163 but soon moving to the #121. I became a regular traveller on the #121 in the school holidays, just for the pleasure of riding on these buses. I always went for the inward facing front seat, which offered not only good forward vision but also a chance to watch the driver. In later life, some of the batch had minor differences. 3621 had "LEYLAND" spelt across the rear bonnet in separate letters (I believe this one also had an O.680 engine at one point), 3626 had a much newer steering wheel with a slightly different design, and our friend 3629 was only a 77 seater while all the others seated 78, the difference being the inward facing front seat which was a treble on most of the batch, but a double on 3629. Finally, 3624 was the only example to receive Selnec livery. Eighteen months later Queens Road Depot got the first of the PDR1/2 Atlanteans (3721-35) for the #163, but these were very different sounding, thanks to their Daimler gearboxes.